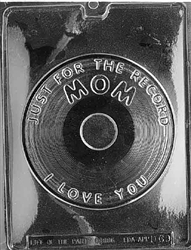 Use with Mom's favorite chocolate as a plate to put treats on or plaster of paris for a permanent record. Mom remembers the LP, so bring back the memories with Just for the Record Mom I Love You Mold. Each piece is 6-1/4" round x 1/4"